Each filter colour has a Visible Light Transmission (VLT) figure, which indicates the percentage of light passing through the filter. A low value will block more light from entering the eye; a high value allows more light into the eye. You should avoid a VLT% that is too dark for your needs for safety reasons. 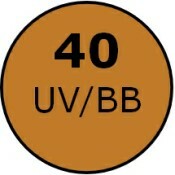 The amber filter is a popular colour for light sensitivity. It offers UV and blue light protection and can help to reduce glare. The economic plastic frame comes in two sizes, medium and large. Medium is suitable for the average adult. Please note: Frame images are shown in greyscale, please refer to the colour swatch above as a guide to the tint of these filters.